A little over a year ago, Bridgman Public Schools first introduced the concept of the RMS STEM Lab to community members in the September 2016 edition of the Bridgman Buzz. 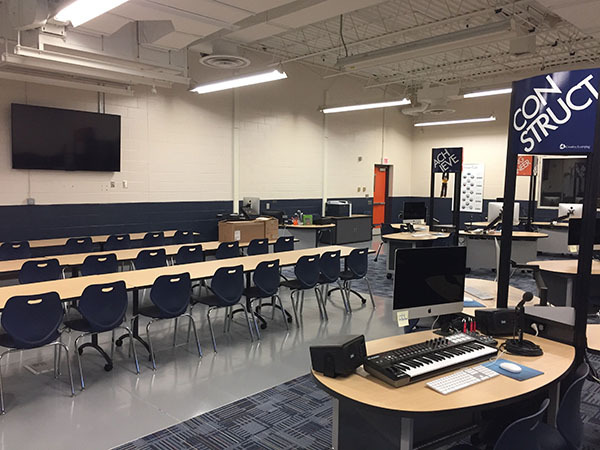 We are excited to report that through the collaborative efforts of Bridgman Public Schools, the Bridgman Foundation for Educational Excellence (BFEE), the City of Bridgman, and the Friends of RMS, the STEM Lab renovation is now complete! All BPS students in grades 5 – 8 are currently busy researching and applying science, technology, engineering, and mathematics concepts through project based learning modules that are offered in the middle school’s new STEM course. Projects in the STEM Lab are designed to utilize an expansive library of curriculum that engages students while fostering creativity, innovation, teamwork, and a love for learning. To facilitate this process, the lab is equipped with collaborative workstations, state of the art computers, a 3D printer, numerous manipulative learning kits, and a full video production studio. In total, the STEM renovation project represents an investment of over $330,000. Obviously that is a very, very large number! However, it’s been incredible to witness the community come together to raise funds to help make the undertaking possible. This grassroots support has been evident throughout the summer. For example, on July 8 the BFEE partnered with Haymarket Brewery & Taproom to organize the first annual Auto & Ales Car Show. The event featured a huge collection of unique vehicles and was a great success. Moreover, from July 21 – 23 the Friends of RMS, Bridgman Public Schools, and the City of Bridgman partnered to host Building Bridgman, a three day sand sculpting competition on the shores of Weko Beach. The weekend not only helped raise money for STEM education, but also provided countless “sand”tastic memories for the hundreds of participants who attended the competition. What makes Bridgman Public Schools such a special place for students is that all stakeholders in our community embrace the district’s vision that together, we can challenge students to succeed. Building Bridgman raised over $5,000 to support STEM education. Private donors and local companies have contributed tens of thousands of dollars to the lab. The Bridgman Foundation for Educational Excellence has now raised over $156,000 for the STEM Lab project, and will continue to raise money to help pay for the project throughout the school year! This generosity is humbling and on behalf of the staff and students at RMS, we would like to thank all of our academic boosters for their support. Your contributions, small or large, have enabled us to expedite the construction of the STEM Lab and have it ready for students at the start of the 2017-18 school year.